Scratch another one off of the bucket list! I know, I know. I sound like a broken record when I ask you if you think things are meant to be or if you believe in luck or fate. But… sometimes circumstances just seem too perfect that calling it a coincidence just doesn’t seem like enough. When you break down all the hours, minutes and seconds in people lives, the probability of putting random elements together is mind-boggling. One extra minute brushing your teeth, forgetting something in the house and going back inside for it, a u-turn on the street – it all changes the timing and outcome of every event that follows it. On Saturday morning as I was exiting the highway in Pennsylvania, I pulled through the toll booth and out of the corner of my eye I saw an unmistakable yellow nubbin’ sticking up over the hedge of a motel parking lot. I knew right away what I was looking at. 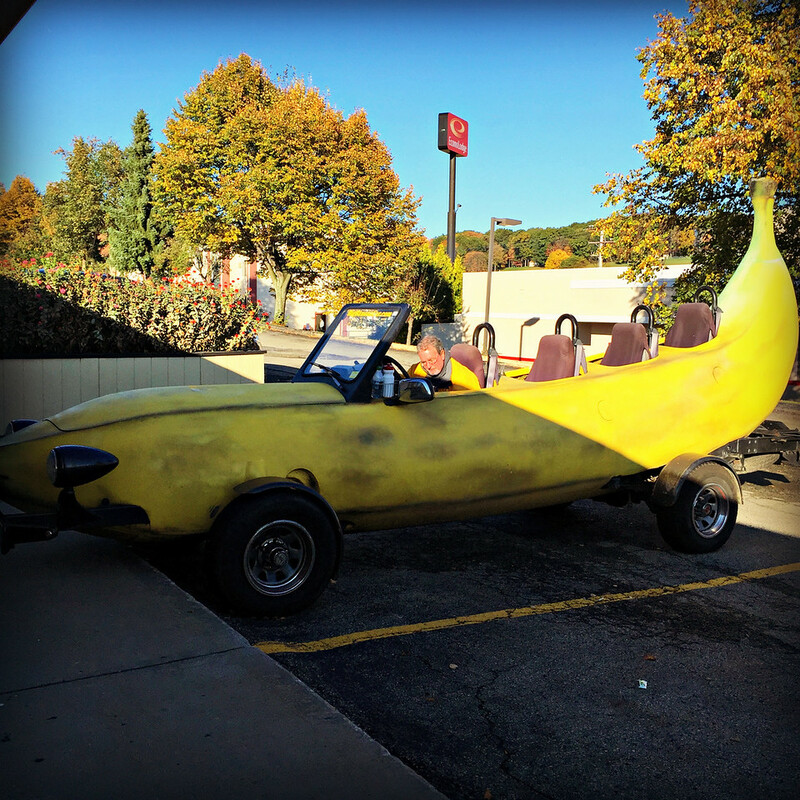 The banana car. 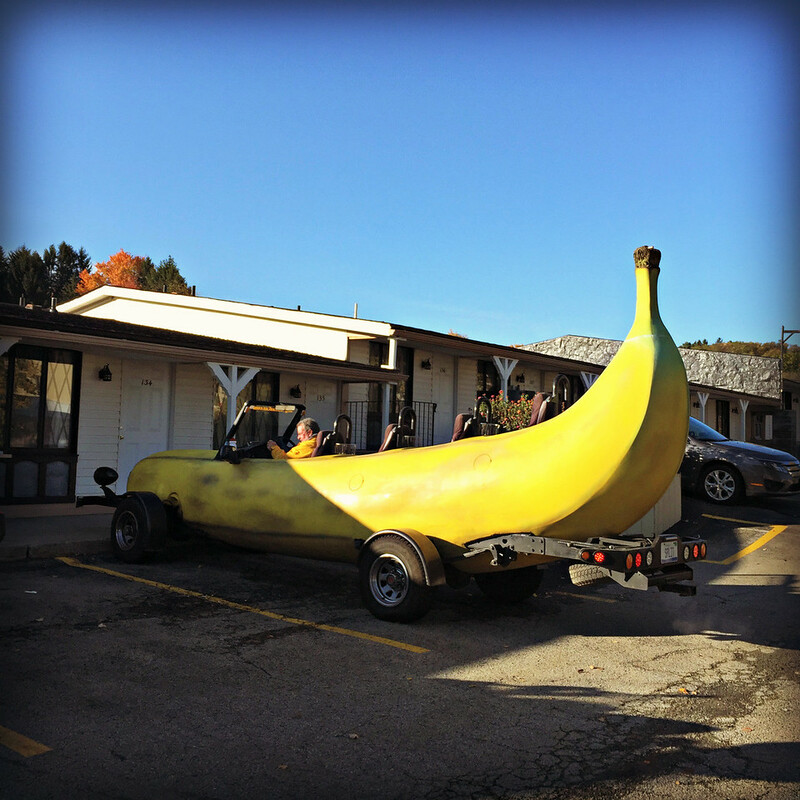 What are the chances that I would run in to the banana car in Pennsylvania? It was almost as if it was meant to be. I can’t believe I got to see it without having to go search for it. The universe just served it up right to me. I am having a great time and ill be making the turn towards back home tomorrow. The time sure flies.